The insurance company does not want to pay me what I feel like my claim is worth. What should I do? How long does it take for a car accident case to close? I was rear-ended. It’s clearly the other person’s fault. Do I still need an attorney? Even though it is clear that the car accident was the other person’s fault, you still have an uphill battle against the insurance company – especially if you were injured. If you were rear-ended, you have two claims. 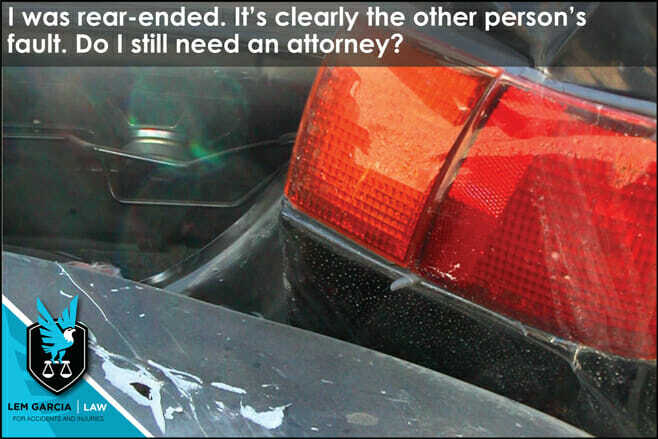 One claim for the damage to your car and another claim for your bodily injury. In your claim for your vehicle, the other party is responsible to pay for your repairs or for the value of your car. The insurance company will pay whichever is less. If the value of your car is less than how much it will cost to repair, they will pay you for the value of your car. If the cost to repair is cheaper than the value of your car, then they will pay you the cost to repair your vehicle. The insurance company will also owe you for reasonable towing and storage fees. Lastly, they will also owe you reasonable rental or loss of use of your vehicle. In some situations, the insurance company will also pay for the diminished value of your car after it has been repaired. In your claim for your bodily injury, the other party is responsible for your medical bills, lost wages, pain and suffering, and mental anguish. This is the portion of your claim where the insurance company will attempt to pay you much less than what your case is worth. The insurance company will most likely argue that your medical treatment and bills were unreasonable, your lost wages claim is not supported, and that you are asking for too much money for your pain and suffering and mental anguish. Yes, liability is clear on your case, but there will most likely be a dispute as to how much damage you suffered due to the crash. Remember, the insurance adjuster’s job is to pay you as little as possible as quickly as possible. If you need help with your car accident case, you should call an attorney for a free case consultation. It is important to talk to an attorney right away because there are many steps that need to be taken after a crash to make sure that you protect your rights and recover what you deserve to the damage the other person caused. West Covina car accident attorney, Lem Garcia, provides free case consultations to people who have been injured in car accidents. Call today for your free consultation without any obligation. We handle personal injury cases exclusively.